Here’s another chance to win a great Gun Digest book for yourself or someone you know: Gunsmithing the AR-15 by popular author, master gunsmith and noted AR-15 expert Patrick Sweeney. Whether you’re interested in simple tasks such as disassembling and maintaining your AR, or if you’re ready to tackle more complex projects such as rebarreling or converting your AR to a piston design, Gunsmithing: The AR-15 tells you everything you need to know. Protect your investment and avoid costly mistakes – with Gunsmithing: The AR-15. To get in on the random drawing, post a comment below and tell us how often and/or where you get to shoot your AR. Or, as always, you can simply say that you’d like to win the book. We’ll announce the winner on Tuesday (Dec. 20). Entries accepted until 11:59 pm Central Time Monday, Dec. 19, 2011. Good luck, and thanks for reading the Inside Gun Digest Books blog! 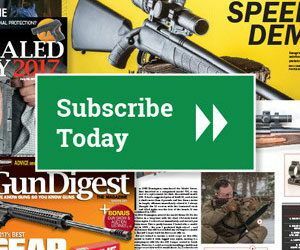 – Gun Digest Book of the Tactical Rifle: Ever feel like burning up some ammo? Well, so does Pat Sweeney! In the Gun Digest® Book of the Tactical Rifle, America’s favorite black rifle expert puts today’s hottest tactical rifles through their paces. It’s a fun and fact-filled exploration of high-volume shooting at its finest. – Buying? Selling? Arm yourself with the facts – with Gun Digest Buyer’s Guide to Tactical Rifles. A seller’s market can turn into a buyer’s market overnight – especially the red-hot tactical rifle market! But how do you know what a particular gun is worth? Simple! Just look inside this trustworthy resource from Gun Digest. It’s all here, from ARs to AKs, from Scorpios to Tommyguns, author Phillip Peterson gives you the straight scoop on everything that can even remotely be considered a tactical rifle. And Peterson, stickler that he is, has even included tactical handguns and carbines. If it’s a tactical or paramilitary in nature, you’ll find it in this book. Includes specifications, current values, hundreds of illustrations, histories, and so much more! Winner will be selected at random and announced Tuesday, Dec. 20, 2011. Wish me luck winning this book. I would love to win it. Dont get to shoot to much any more, too far to drive, not much money to spend these days. I go shooting my ar every chance I get….not enough though. I just built a new AR, and still have yet to get out and shoot it. The local indoor range just opened up its rifle lane so hopefully this Christmas holiday season I can finally get it sighted in. I would love to win this book. I just bought my first AR, an MP15, on black friday. I have two Colt SP1s,The past few years I only shoot about 1200 rounds a year. This book will be well used. I try to get out to shoot at least every other week. Would like to buy another AR, but for time being will be putting an Eotec 510 sight on my fixed carry handle Bushmaster. This book would help me keep up with proper maintenance and ideas for a future AR. I dont have an AR–YET. I hope this book will start things, then Santa Claus steps in. Hey, we all have to start somewhere, right? I’ll keep my fingers crossed for your Santa wish! I’dLove to win this book. Just getting into shooting my AR and I love it. I try to get out at least once a month to shoot.